Back row, left to right: 18375 Driver (Dvr) Edward Collins; Gunner (Gnr) Smith; 18647 Gnr Francis Frederick Corkery;18376 Bomdardier (Bdr) Arthur Doughty, (brother of 18449 Gnr Charles Doughty) ; 18449 Gnr Charles Doughty, Rozelle, NSW. ( died of wounds in Belgium on 19 June 1917); 18385 Gnr George Etches McKinnon; 19278 Dvr Charles Matthew Gardner. 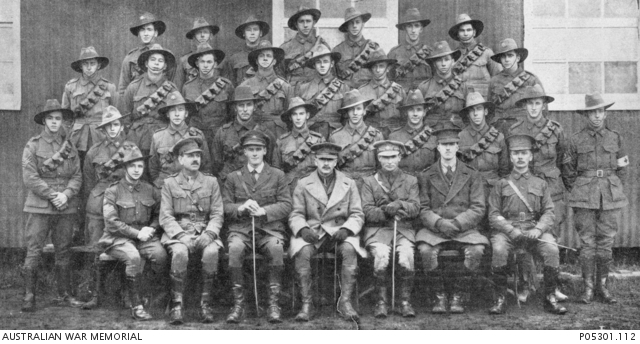 Third row: 18387 Corporal (Cpl) Reginal Kenneth Patrick; 18372 Dvr William Moore Alford; Dvr Williams; 18374 Gnr Thomas Cassidy; 19365 Gnr James Gordon Talbot; 18390 Dvr Horace William Robinson; 18403 Dvr Edward McGregor Wilson; 18391 Dvr William Thomas Reece. Second row:18398 Sergeant (Sgt) Charles Eric Thompson; 231 Gnr Frederick Allatt; 18386 Bdr Bernard McManus; 119 Gnr Alfred Meakin Horne; 18392 Gnr Arthur Grey Hazelrigg Shannon; 18399 Gnr Francis Cecil Gilbert Tindale; Gnr C Thompson; 18400 Dvr Allan Lindsay Tully, (later MM, DCM); 22826 Dvr William Joseph Moroney; 14236 Cpl Frederick Burleigh Hinds. Front row: 18371 Staff Sergeant (SSgt) William Allatt; Lieutenant (Lt) George James Hammond; Captain (Capt) Cedric Murray Samson, (later MC and bar); Lieutenant Colonel Henry Dundas Keith Macartney, (later CMG, DSO, AFC); Capt Charles Noris Callow; Lt Jordan; 18396 Warrant Officer Class 1 William Matthew Squair.